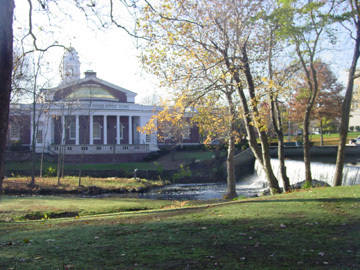 Milford, CT - "The small town with the big heart"
Like three delightful destinations in one. 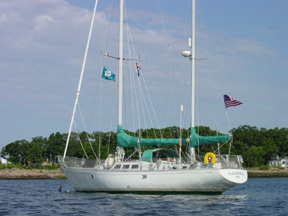 We have visited Milford by boat on numerous occasions and have still not run out of things to explore. 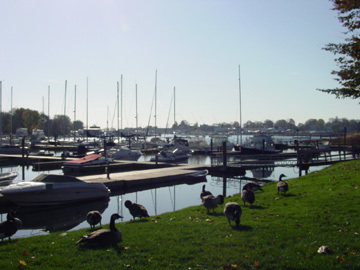 From the idyllic anchorage between Charles Island and the mainland, to the numerous marinas along the protected inner harbor, to the charming "New Englandy" center of town, there is plenty to explore and enjoy for just about anyone in three distinct community environments. February 1, 1639 is when the area then known as "Wepawaug" was purchased from Ansantawae, chief sachem of the Paugusset Tribe. Settlers began arriving shortly thereafter and began to build the town known later as Milford. Although primarily agrarian, shipbuilding, oystering, small industry and trade on the open seas from the harbor were part of the local economy. The early 1900s brought the leather industry along with the making of boots, hats and shoes. Milford was also famous for carriages. After World War II, the population swelled as GIs returned from the war. Industry also developed to support the war effort. Norden, Milford Rivet, U.S. Motors, and Edgecomb Steel were some of the familiar names of the time. Other industry followed most notably the consumer giants of Bic and Schick. Then the completion of I-95 in 1960, with its seven exits and entrances brought easy access. The Connecticut Post Shopping Center and other development followed rapidly. Development reached a peak in the 70s and 80s, leveled off in the early 90s and then picked up again in the late 90s until the present population of over 52,000 was reached. Started in 1975, the Annual Milford Oyster Festival has grown into the largest one-day festival in Connecticut that each year attracts over 50,000 people. 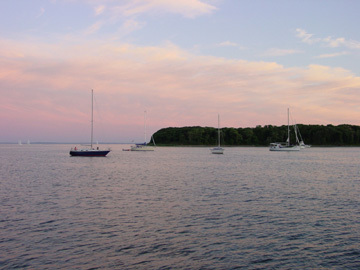 The Annual Milford Oyster Festival is held on the third Saturday of August every year, with 2007 marking the 33rd occurrence. The festival has grown from a tiny local one-day celebration of the oyster and the seaside community into one of Connecticut's summer highlights. Festival visitors have a choice of activities including entertainment for children and music fans, harbor canoe and kayak races, over 200 arts and crafts vendors from around the country, a classic car show and tremendous food offered by local non-profit civic organizations. 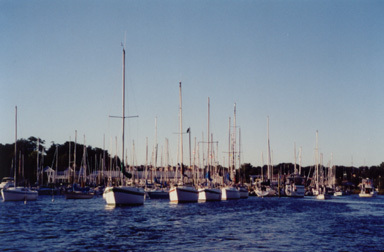 The Annual Milford Oyster Festival takes place right in downtown Milford and along the Milford harbor. Waterfall in the center of town. Milford, although a distinct town in it's own right, is essentially a suburb of both Bridgeport and New Haven, being located smack between them. And although industry did arrive here throughout history, it did not completely dominate the waterfront but rather allowed the waterfront to remain relatively unspoiled, and preserving much of its natural beauty. The approach to Milford from Long Island Sound could not be more straightforward. 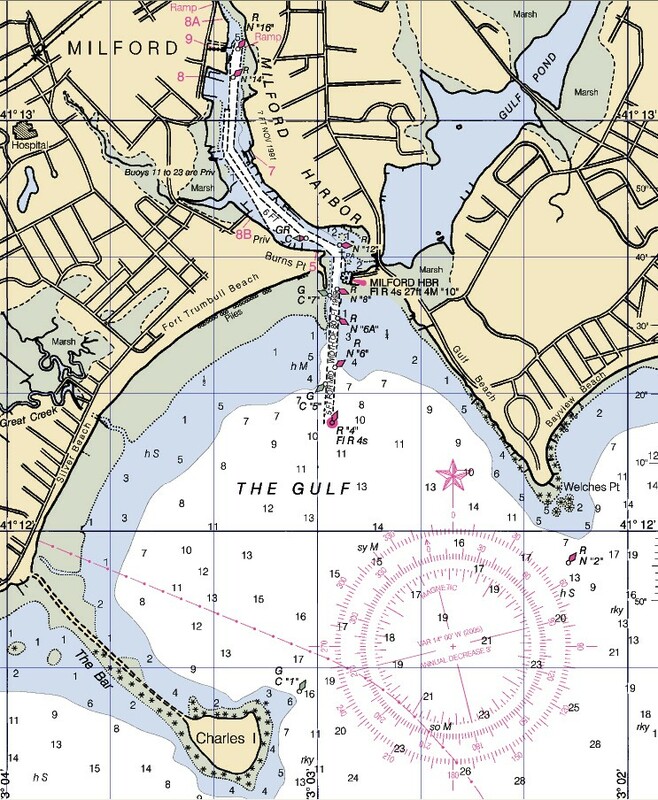 Rounding Welches Point from the East, it's a straight shot to the main harbor entrance at Burns Point. 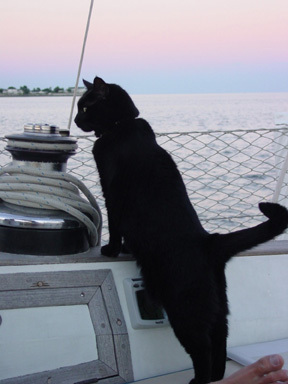 Take care to follow the channel markers carefully, as the depth outside the channel goes down to 1 foot or less at the entrance to the harbor. The channel was dredged in 1991 to a depth of 9 feet across 100 feet of width, and we had no difficulty navigating with a 7.5 foot draft. If you'd rather anchor out, the anchorage in the lee of Charles Island is delightful, with good holding, spectacular sunsets, and lots of good boat and people watching activity. 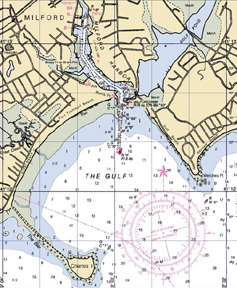 Do not attempt to pass to the northwest of Charles Island as The Bar connecting Charles Island to the mainland becomes visible at the surface at very low tides. The three areas of Milford are so dictinct, we decided to break up the discussion into three separate topics. Please click on the links below to learn more about these charming distinctions. Channel into Milford Harbor was dredged to 9 feet MLW. Onyx watching all the activity with interest.